Welcome to #IceCreamWeek! Kim of Cravings of a Lunatic and Jen of Juanita’s Cocina have teamed up with more than 20 of their blog friends to bring you a week full of ice cream treats, including a special ice cream giveaway, and our party week ends TODAY! Prepare to have your taste buds tempted with some of the best ice cream treats around! 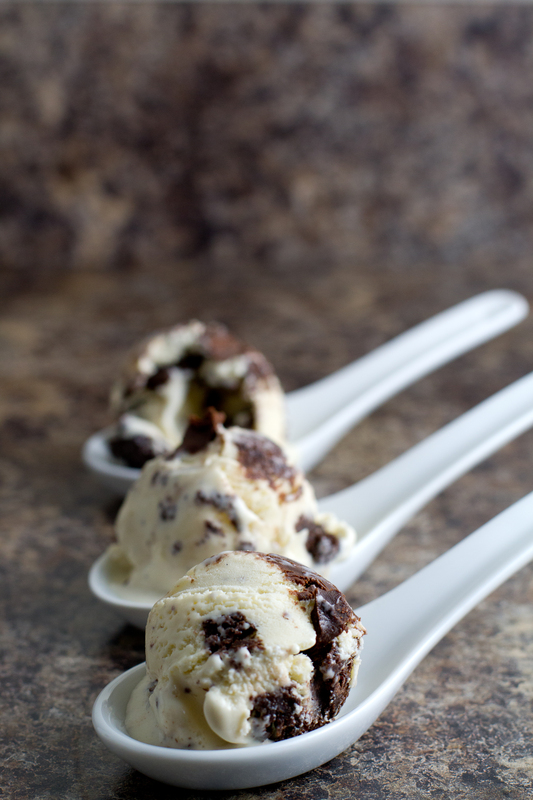 On this last day of #IceCreamWeek, I offer you Brownie Fudge Ripple Ice Cream: a decadent treat that’s a pleasure to eat! You can certainly make homemade brownies to mix in–I have a few options for you if you’d like to go that route. This time, however, for simplicity-sake I used a box mix. I know, sacrilege! What can I say? I’ve had a hard time giving up Trader Joe’s box brownies–there’s just something about them I haven’t been able to replicate. So yeah, I’m giving you permission to take a shortcut this time. It’s okay because you’re still going to prepare the custard and ganache. If you stash your brownies in the freezer for a few hours before cutting, your life will be a lot easier. No brownie gunk sticking to the knife! 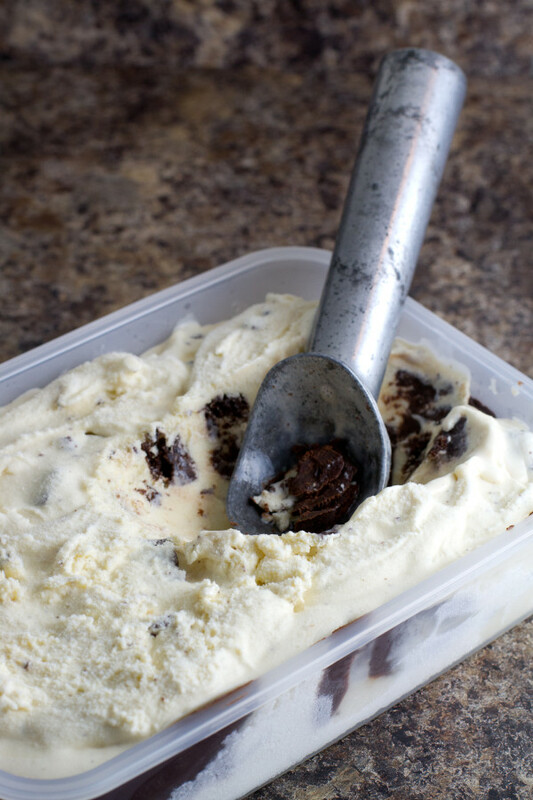 (Not that there’s anything wrong with that…) It may seem like there are a lot of steps in this recipe, but you can make the ice cream in an evening and have it ready to eat the next day. Trust me, I know from experience. Not that I would ever leave anything to the last minute. No, not me! Today we are celebrating Jen of Juanita’s Cocina‘s Birthday with an Ice Cream Party! We love Jen oodles and bunches! We invite you all to head over to her website today to wish her the happiest of birthdays. You can also stop by her Facebook wall to wish her a Happy Birthday there, as well! Let’s spread the love! In a medium, heavy-bottomed sauce pan, whisk together the half-and-half, sugar, and salt. Heat over medium flame until bubbles form around the perimeter of the pan. Whisk together the egg yolks and vanilla bean paste. Add about ⅓ of the heated milk mixture to the egg yolks in a slow, steady stream, whisking the whole time. Add the egg mixture to the remaining milk mixture in a slow, steady stream, whisking the whole time. Continue heating until it has thickened into a custard coating the back of a spoon. Fill a large bowl with ice cubes. Place a strainer over a medium/large bowl and pour the custard through it, then place that bowl inside the ice bath, stirring every few minutes until it cools to room temperature. Cover and store in the refrigerator for at least 4 hours before churning. Process in your ice cream machine according to manufacturer's directions, adding the cubed brownies in the last 2 minutes of churning. While that's churning, heat the heavy cream in a small sauce pan until bubbles form around the perimeter of the pan. Dump the chocolate chips into a heat-proof bowl and pour the cream over them. Let sit for 1-2 minutes, then stir until smooth and shiny. Once the ice cream is done churning, layer it with the ganache: a layer of ice cream, a layer of ganache, until your container is full. Store in the freezer for at least 4 hours before serving. Please join us today, Saturday, August 17th at 2 p.m. (Eastern Daylight Time) for our PinChatLive Event happening simultaneously on Pinterest and G+. We’ll be announcing the winners of our giveaway and talking ice cream! Please join us for our Ice Cream Social at 2 p.m.! We have ice cream cookbooks up for grabs. We also have 10 Ben & Jerry’s Swag Prizes up for grabs. So check out our Pinterest Board, #IceCreamWeek, during the event at 2 p.m. today to win one of these amazing prizes! 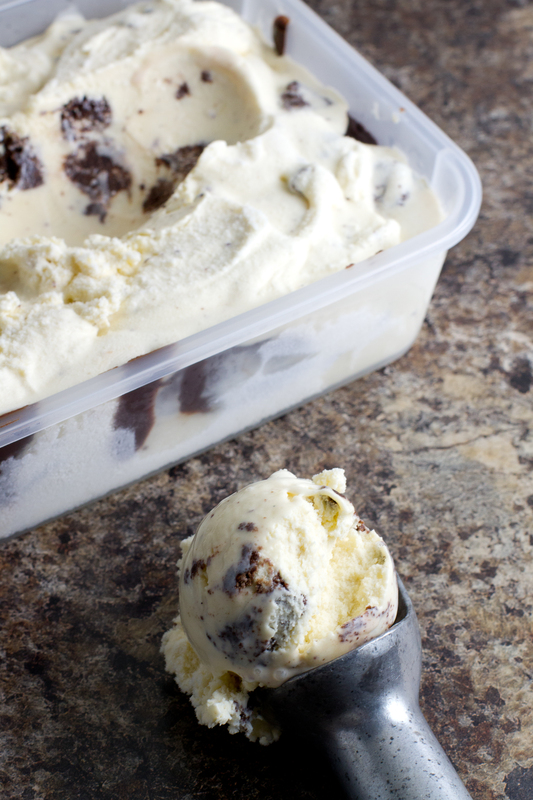 Holy cow, brownies and fudge in ice cream?!? I am in looooove! 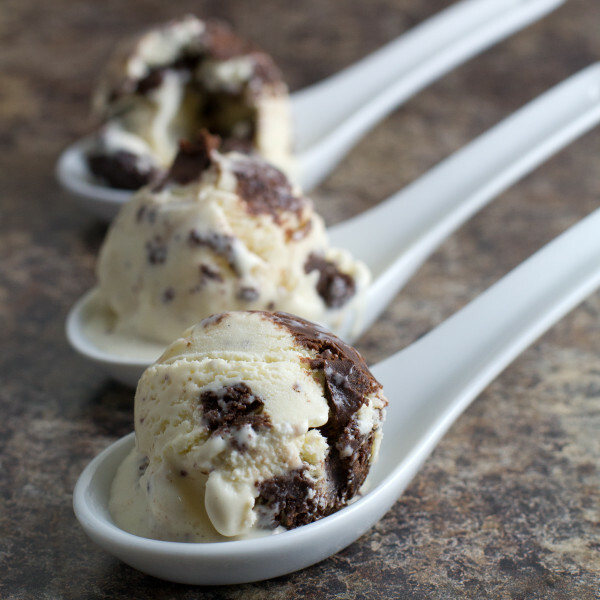 I am such a brownie addict and they are natural partners with ice cream so this is just amazing. Yum!! 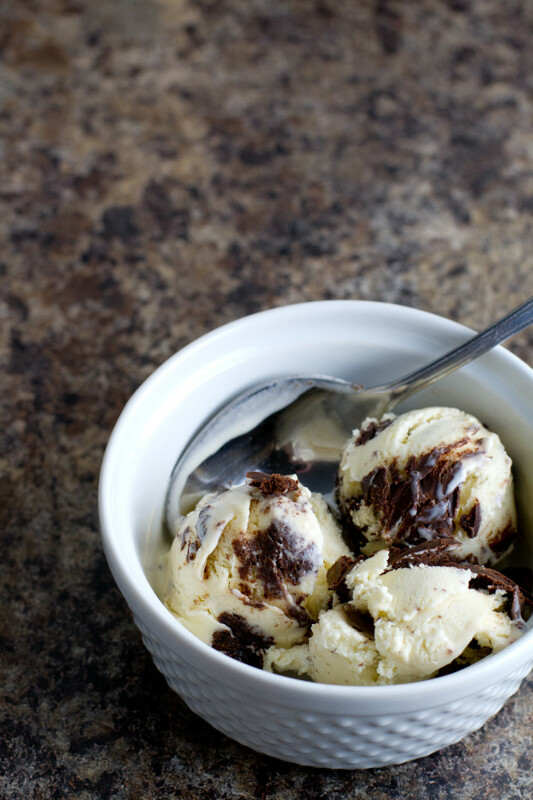 Oh my gosh…now all I want is this ice cream and vanilla bean paste! I’ve only been a recent convert to vanilla bean paste, but WOW. Yeah, vanilla beans are great, but this really packs a punch!